These reviews will focus on the new paint jobs. Read my reviews of the original molds here:(Bumblebee, Crosshairs, Drift, Hound, Optimus Prime. In robot mode, the new version has silver toes, silver on the sides of his legs, and silver pistons on his torso. He has yellow stripes on his thighs and sides of his chest. He has black striping on his arms and arm cannon. 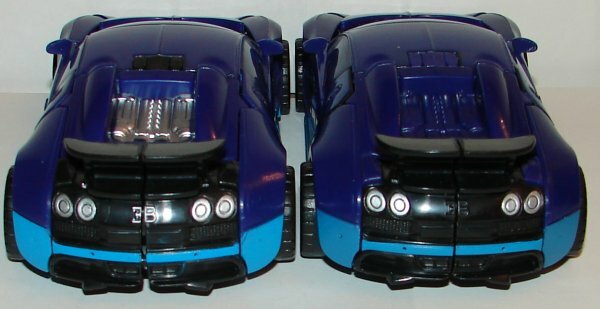 In vehicle mode he has silver hub caps and silver logos on the sides of the vehicle. He’s got black on the small triangular windows behind his doors, rear bumper, and rear spoiler. Also the black striping on his hood and roof are continued onto his trunk (and it is unforgivable this wasn’t done on the original). They also painted his taillights. Nice of them to actually finish painting him this time. The regular version looks like they got 3/4 done and decided it was enough. He’s a great improvement over the original, but most of that improvement is because of the incompetence with which the original was painted. His overall coloring stays the same. This is not the case with some of the others in the set. His overall green color has been changed. I really like it. In robot mode the new version has green feet silver toes and darker silver on his knees and thighs. His torso is green with dark silver and red. He’s got a red Autobot logo on a black patch on his chest. He’s got blue eyes with silver goggles. They added black striping on his forearms and red paint apps on his arms, and more black on his shoulders. 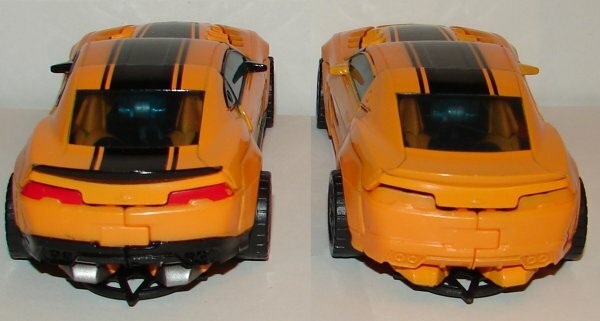 In car mode, they changed the black striping patter and continued it on both sides of the vehicle. 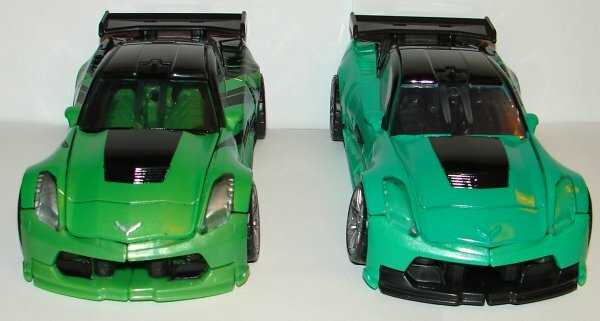 His seats and black and his front bumper is now green with a patch of black. They painted the logo on his hood silver. They painted his headlights and taillights. 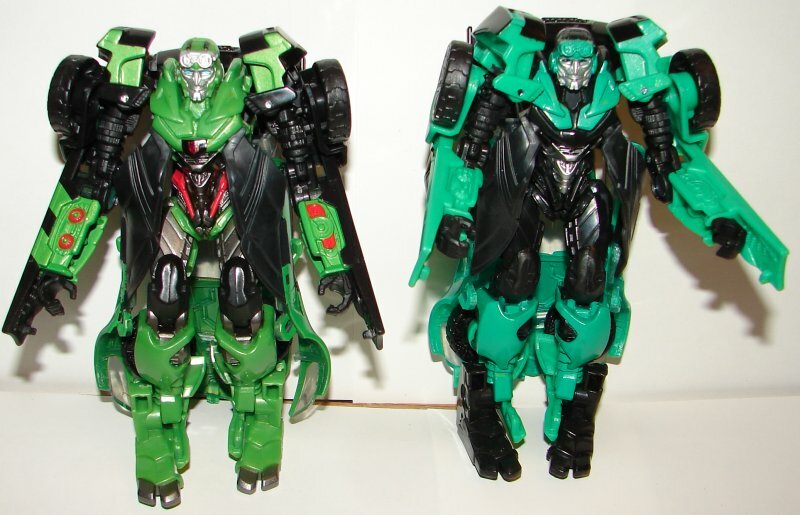 Crosshairs looks phenomenal. He’s a huge improvement over Hasbro’s half assed retail version. Hmmm… Perhaps I’ll start calling them Half-assed-bro. But I digress. Drift looks sweet! 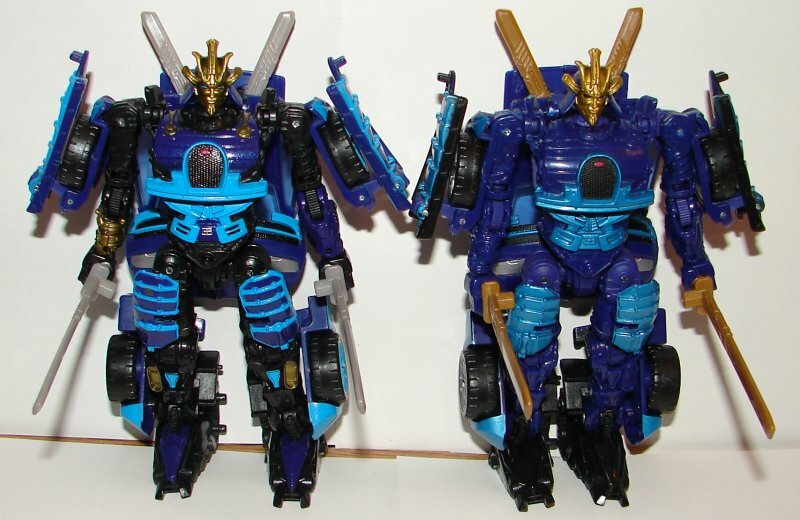 They changed the metallic light blue to a darker richer blue making his two tone color scheme really look nice. His shoulder and thigh samurai pads are now two tone blue instead of just blue. His weapons are gray instead of gold. 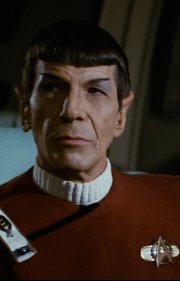 He has black stripes and a silver vehicle brand logo on his lower torso. His waist is black as well as his upper arms and he has gold on his right forearm. His legs are black with more gold paint apps. His upper chest is also black with some gold apps. They used darker gold on his face and gave him blue eyes, which looks great. 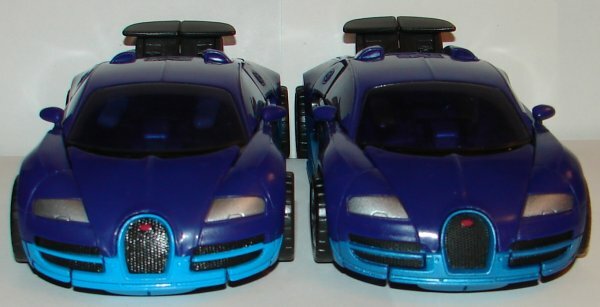 In vehicle mode his hubcaps match his lighter blue. Frankly I think the hub caps would have looked better in silver, but it still looks great. His engine is silver, one of the most idiotic things left out of the original version, and they added the silver logo on the back end of the vehicle. The overall changes on Drift are not quite as striking as the changes to Crosshairs, but he’s still a huge improvement and looks really great. I love what they’ve done with Hound. 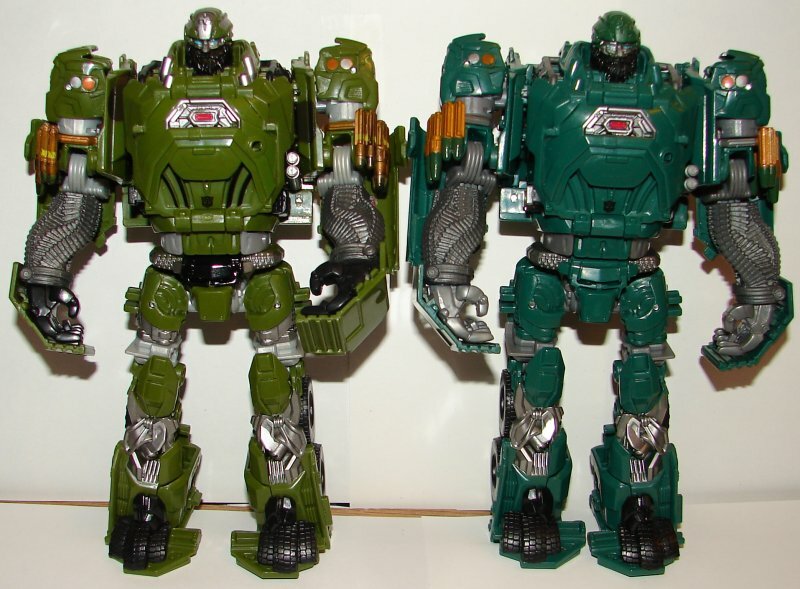 Overall he’s more army green than the dark green he was originally, and he now has black camouflage markings. They added silver paint on his thighs and gave him black hands. You can’t see it in the photo but one of the strips of ammunition that makes up his arms is red. Not sure why that is, I would have preferred all the ammo be bronze with silver tips. He’s got more paint apps on the missiles on his upper arms. He has silver on the sides of his neck and his helmet. 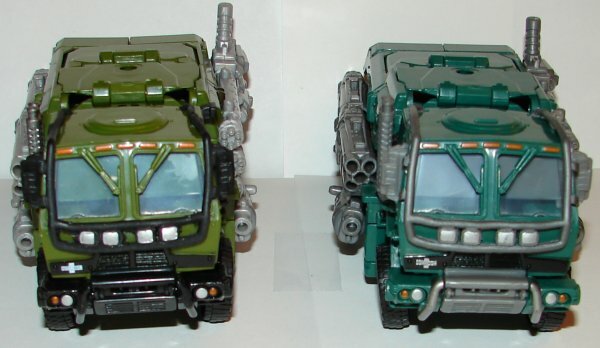 In vehicle mode they made the metal bars, side mirrors, grill and some other details around the cab black. On the left side of the vehicle they added a star emblem. Very nicely done. If only they had fixed the pegs that connect the weapons, but that would be too much to ask of Half-assed-bro. 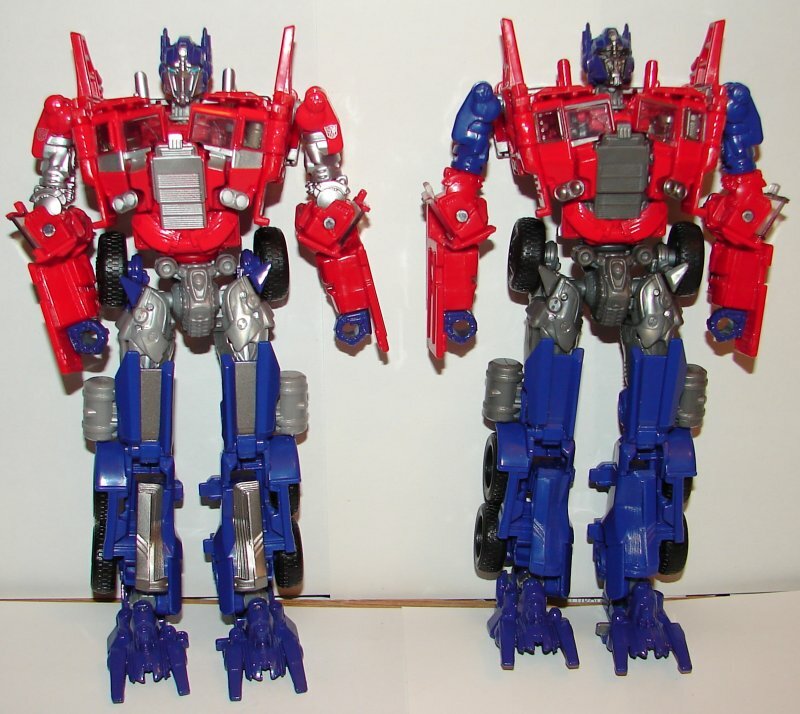 They did a nice job on Optimus Prime. His gray plastic is a lighter gray color, but it would have looked better all in silver. He has silver stripes on his lower legs and thighs and blue on his hips. 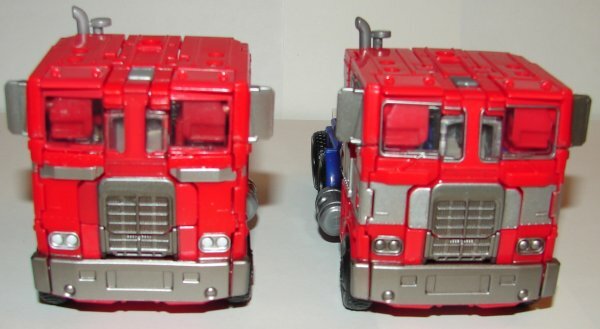 His grill and headlights are painted silver and there is a G1 style silver stripe across his chest. He’s missing the wide silver stripe beside his head that the regular version had. His fake smokestacks are painted silver. He uses the faceplate head sculpt and it’s perfectly painted. He has a much better looking black gun. 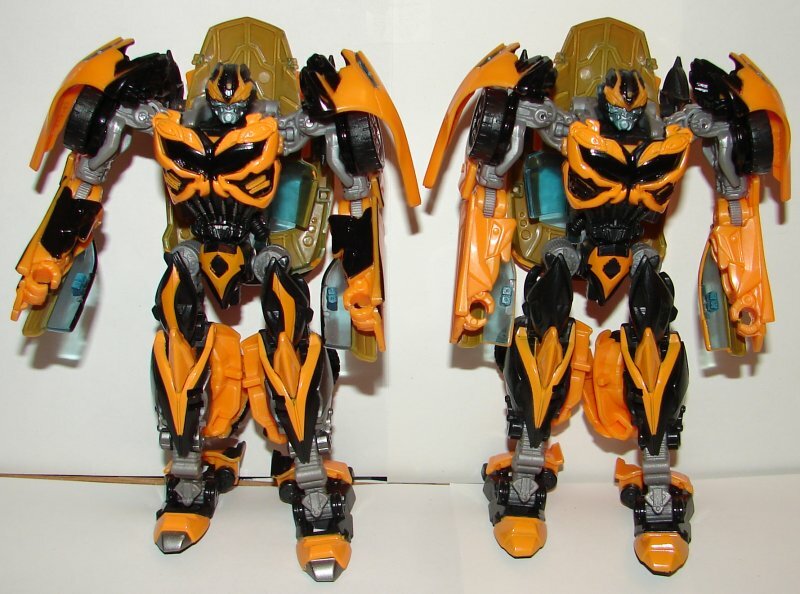 His upper shoulders are red and have Autobot logos, and his middle arms are silver. 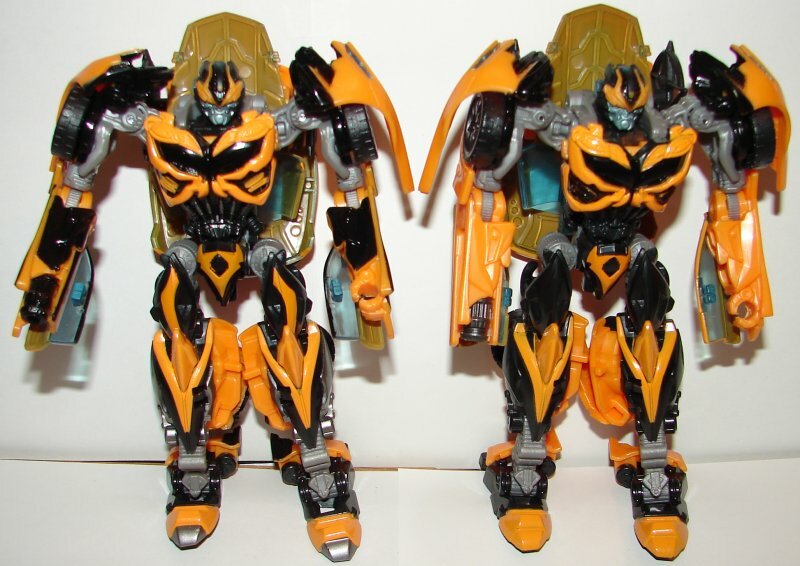 In robot mode they removed the thick silver stripe in favor of a thinner one. Looks cool. Oddly they removed the silver from around his front windows. I kind of liked that, but my guess is they didn’t want to accentuate his hideous design flaw (the sides and center of the truck front still won’t line up, another unforgivable failure on the part of Half-assed-bro). The side of the truck now has Autobot logos in the G1 position. They changed the painting of his small side windows. Some of his blue plastic is now painted blue. This is because of other color changes that required changing plastic colors. This makes the ports on his flat bed red. Overall he’s very nice, but I’ve lost count of how many of this mold I have. This one and the heavily chromed one would have been enough. Overall: This is a really great looking set. It’s just incredibly overpriced at $125. $100 would have been reasonable. 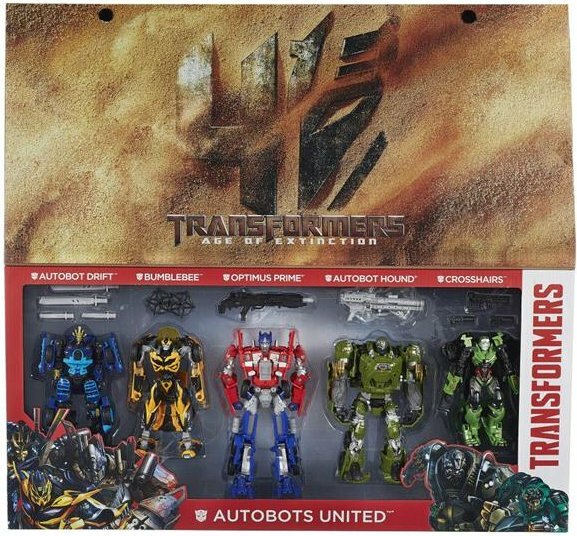 What really bothers me is that this is proof that Hasbro KNOWS that they give us crap. They KNEW that the retail versions were inferior product so they could jack up the price and sell them to us again later. The only other explanation is that they are completely incompetent and really thought the retail versions were worth what we were paying for them. While I will grant that Hasbro has shown it’s fair share of incompetence over the years, they do get it right sometimes. The only conclusion is that sometimes it’s on purpose, and I hope all these overpriced platinum sets sit unsold and end up on clearance. Stores don’t have them at all yet, which considering this is the time of year they might be able to unload them, is really stupid. That one might be on Toys R Us. This entry was posted in Toy Reviews, Toys, Transformers and tagged Age of Extinction, AOE, Autobots United, Bumblebee, Crosshairs, Deluxe, Drift, Evasion Mode Optimus Prime, Hound, Optimus Prime, Platinum Edition, Platinum Edition Autobots United, Toys, Transformers, Transformers: Age of Extinction, Voyager. Bookmark the permalink.